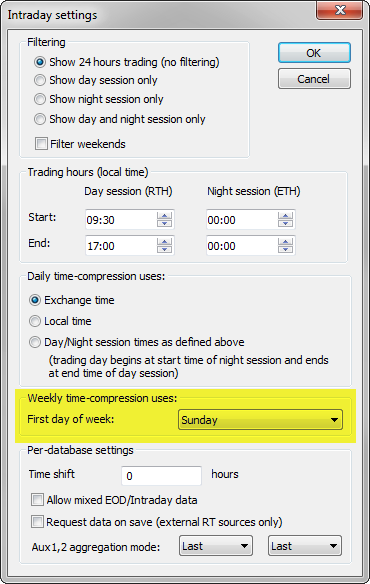 AmiBroker allows to define, what days to use for weekly compression. By default weekly compression uses Monday-Sunday week (i.e. Monday being the first day of the week), we can change it however to any custom day of the week to match our local calendar. To choose the day to be used as the first day of the week, we need to go to File->Database Settings->Intraday Settings and choose the appropriate day in “First day of week” field. The above example shows custom-defined week, which starts on Sunday and ends on Saturday (i.e. working Sunday-Thursday week, as in many Middle East countries).